Solid-state sensor is one of a new crop of interesting, eco-friendly tools and technologies. Carbon nanotubes are stronger than steel, conduct electricity better than metals and can filter water of impurities better than many conventional systems. And now they might show up on the farm. 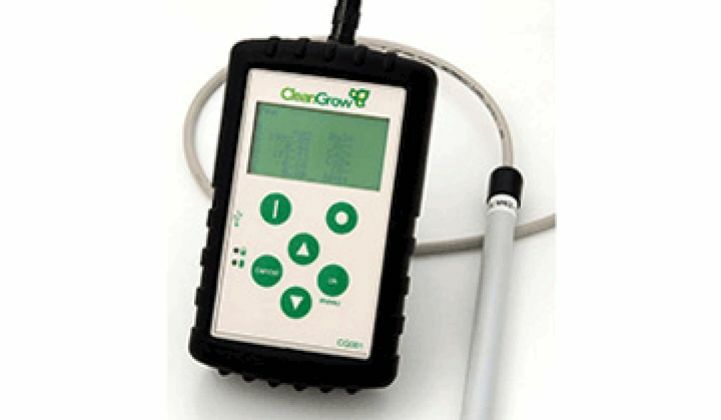 CleanGrow, based in Ireland, has developed a carbon nanotube-based sensor for monitoring the level of nutrients in crops. Changing the mix of nutrients can allow farmers to alter the color or maturity rate of fruit, flowers or vegetables. With interest in vertical farming and resource-efficient agriculture on the rise, it’s the kind of tool that could find a ready audience. Sending data to a lab, of course, takes time. Many of the labs are in the Netherlands and the round trip can take close to a week. Lettuce only takes about 28 days to grow, so a week is one-fourth of its life span. The primary concerns of farmers, he added, is yield, yield, yield, and increased yield. So how does it work? Conventional nutrient probes are analog devices and capture a composite picture of the current environmental conditions in miniature. In CleanGrow’s device, a nanotube sensor tuned to a specific ion -- nitrate, sodium, etc. -- sits on one side of a membrane. As water passes through, the sensor detects the presence and quantity of the target ion. Up to 18 different sensors tuned to different ions can be placed on a probe head. While venture capitalists will often talk about the growing importance of the food and water markets, agriculture hasn’t been showered with the whopping loads of money that have gone into biofuels, solar and energy efficiency. Nonetheless, interest seems to be growing. Many of these startups will sell straight to agribusiness, not government agencies, which makes them more attractive to investors. Some (like CleanGrow) are really mostly taking IT tools to farms, similar to the way efficiency companies have brought networking to air conditioning and lights. That’s an easier sell to investors. AeroFarm Systems: Calling themselves "The Future of Urban Agriculture," AeroFarm is developing aeroponic technology for growers of "leafy greens" in the $4 billion bag-salad market. The design of their farming systems uses no soil, a minimum of fertilizers and water, and can be stacked to maximize space. The company envisions using buildings in NYC to grow salad greens with enormous yields using LED-based lighting. Grow lights could be an early application for LEDs. Inka Biospheric Systems: Vertical food-growing systems and "micro-farms" that support hydroponics -- suitable for urban gardens. Local Dirt: An early-stage firm that matches producers of locally grown food with buyers. Marrone Bio Innovations: Environmentally responsible products for weed, plant disease and invasive pest management. Marrone uses naturally occurring microorganisms for integrated pest management -- insecticides, herbicides and products for controlling invasive mussels in waterways. Founder Pam Marrone also founded AgraQuest, another biopesticide company. Open Blue Sea Farms: Open ocean, caged "free-range" fish farmers. Open Blue’s initial species is Cobia, a sashimi-grade, marine white fish, targeted for the gourmet seafood market, the upper 20% of the seafood industry in the U.S.
Pasteuria Bioscience: Nematodes, also known as roundworms, are the most numerous multicellular animals on earth and many of them are parasitic on human agricultural products such as turfgrass and strawberries. Chemical control of nematodes is a multi-billion dollar business and Pasteuria Bioscience has developed a cultivation method for naturally occurring soil bacteria that specifically attack plant-parasitic nematodes. PurFresh: 20 percent to 40 percent of fresh food is lost to over-ripening or decay. PurFresh has a family of products that spans the food supply chain in the pre-harvest, post-harvest, transportation and retail phases to address this issue. Their transport product "snaps" into marine containers and kills mold, bacteria, and viruses, as well as eliminating ethylene, which accelerates ripening. The unit also measures atmospheric and physical conditions of the food environment, such as door breach, CO2, and O2, and communicates this information via satellite. The company made our Top 50 Startups list. Solum: Solum makes a field-deployable measurement tool that gives immediate answers on soil nutrient needs. Fertilizer amounts to 40 percent to 50 percent of the operating expense for corn, but it is currently applied in an inefficient manner, with calculations based on average values rather than per-acre needs. Solum allows farmers to apply fertilizer in the right amount, at the right place, at the right time. Verdant Earth Technologies: Developed at the University of Arizona, Verdant’s system is a controlled-environment high-yield agriculture process that will allow crops to be grown anywhere, with no soil and little water, in shipping-type containers that provide a growing environment for a variety of foods. The system can produce up to many times more food per square foot than conventional farming methods.